Vince Lombardi is regarded as one of the greatest coaches in the history of sports. What he did with the Green Bay Packers is legendary and today the NFL Superbowl trophy is titled the Vince Lombardi trophy. He was a man who taught many what great coaching was. He is a man known for great speeches, an inspiration to many. And there is one aspect of his coaching philosophy which I wish to focus on in today’s article. And that is love. Lombardi said “You, as a leader must possess the quality of mental toughness. This is a difficult quality to explain, but in my opinion, this is the most important element in the character of the leader. Mental toughness is many things. It is humility. It is simplicity. The leader always remembers that simplicity is the sign of true greatness and meekness, the sign of true strength. Mental toughness is Spartanism, with all its qualities of self-denial, sacrifice, dedication, fearlessness and love. This passage from one of his wonderful speeches taken from What it takes to be #1 | Vince Lombardi on leadership.The book is an education in to what is required to succeed as a coach. Lombardi worked with college athletes as well as professionals and gained the respect and loyalty of his players through his principles, character and the relationships he forged with them all. Tactics or relationships the key to success? There are many who look at coaching and see the ‘X’s and O’s’ on a tactics board and think that this is the key for successful coaching. It helps for sure. A deep knowledge of the game, an ability to understand, dissect and know how to change/adapt a tactical style can be regarded as great management. The word ‘tactician’ is afforded some of the greater coaches in sports. Without a deep knowledge of the game it will be hard to become great as a coach. However, attend a coaching course and the majority of the time will focus on delivering a session to players constituting of the set-up, the organisation and the key points required. Yes of course this is important. But as I’ve said before, the first time I experienced something other than technical detail of drills and practices was on the A licence course. Yes this is the highest qualification, the degree version of coaching, and therefore the depth and quality should be higher, granted. However there are not enough coaches of players in the game attending this course, yet alone achieving the qualification. The problem here is simple, the key aspects of coaching are not taught until the final stage of the coaching pathway. It is lunacy for me. And here’s why; the quality of a great coach lies in their ability to forge relationships with their players while being able to persuade and convince the individuals to enhance their development. This idea of relationships and persuasion fall under the realm of psychology, sociology and communication. These three areas are for me the key to successful coaching. This blog has talked often about Phil Jackson’s coaching philosophy and the incredible success he had with the Chicago Bulls and LA Lakers. His belief is in the spiritual bond of the group. He focuses on the need for selflessness in the way they play, giving their self to the team and achieving a greater strength as one. He builds his philosophy on one of Zen Buddhism. The periods of meditation of a team may have been embraced more so than others in Jackson’s teams yet that deep sense of togetherness brought a group closer together and made them stronger as a team. Jackson believed in a different way to coach, he believed in building strong relationships with his players and his success proved his methods worked. Let us take Jose Mourinho. Mourinho is a very intelligent man who understands the game of football and has a very in-depth, analytical mind to tactics and game management. Yet his biggest strength is the ability to forge a squad of individual players into a committed and unified team. He builds some of the strongest bonds with his players which continue well after their relationship as player and coach ends. What Mourinho does is work on personal relationships to enhance the players quality on the pitch, as well as his willingness to sacrifice and work for the team. While Mourinho’s persona in public seeks to convince us all that he is cold and callous, the the truth is he is one of the most open, honest and friendly men and coaches in sports. His success is down to this. Mourinho loves his players, and they in turn love him back. And through this bond they succeed together. His career is defined by these relationships, by the bond his teams possess. His method is not necessarily what he does on the training ground (although he is as detailed a coach as there are) but more about his relations with players. It is psychology and communication skills which build trust and respect and which generate a togetherness which makes the team very hard to overcome and defeat. And what about Pep Guardiola, the picture at the top of this article is of Guardiola’s final game at Camp Nou with Barcelona before left. The bond he forged with Messi was a key reason as to why Messi has become of the greatest players ever in the game. I genuinely believe this. He nurtured him to become the best. Busquets and Pedro would perhaps not have the medals they have was it not for Guardiola and his coaching methods when coach at Barca B. This is a coach who has seemingly revolutionised the game both in training and game play methods. He is seeking to push the boundaries of the game, trying to evolve it constantly. Yet the key to his success as a coach is down to his relationships with his players. In the book Pep Confidential it discusses Pep’s time in New York and how he would attend lectures of Colombia University on innovation and social economics. He was extremely interested in individual communication – far more so than group communication. 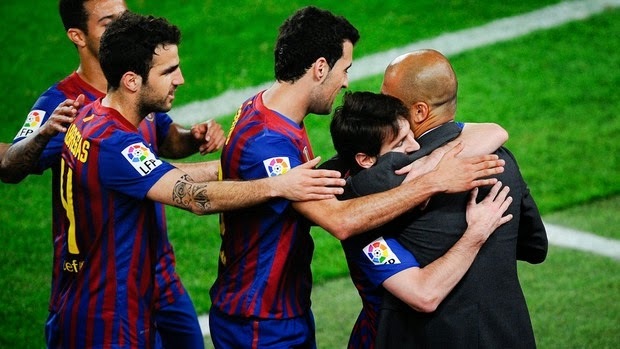 Guardiola believes in personalised communication – in finding ways to get his feelings and beliefs across to his players. He is always seeking to enhance his relationship with individuals. What a great message for coaches. Many coaches treat each player the same. However every individual is different and every player will require a different type of communication, of treatment. As the author Martí Perarnau “The trick is working out how to interact with each individual. Their boss (Guardiola) is learning and improving the way he communicate with each of them”. Guardiola is one of the best at forging relationships with his players, yet he is adamant that the player must want to improve and listen, this two way sense of communication and relationship has led to the breakdown in relations with several players in the past few years. However, what is for sure is that Pep loves his players, his obsession in his work, his passion to achieve and constantly improve is insatiable and energetic yet exhausting too. He expects so much from his players that burn out of both coach and players seem inevitable, yet the journey is sublime. A constant enhancement and evolution of ideas and tactics, of personal growth and relationships. This is what football is about. After looking at some of the best coaches in sports let us consider the impact or difference these kind of methods have on young players. There is a common saying that young players are not adults and they should not be treated as such, I totally agree. However when we look at what these coaches have achieved with their methods of building relationships, of harnessing trust and respect from their players, then is certainly a crossover between the two levels. The problem unfortunately for many coaches of young players is that their role models in terms of coaching have been autocratic, command based coaches. The shouters, swearers and in truth flat out bullies. Too many young players are subjected to this kind of ‘learning’ environment, one which is led by fear over love. Now fear will ‘work’ to an extent, players will work hard and do their best, yet only because they worry about the consequences if they don’t. The fear of being shouted at or of being subjected to ridicule if they make mistakes. This culture of fear is detrimental to the development of future talented players because the player will never feel comfortable enough to relax and try new things. What ensues is the rigid and simplistic style of play which banishes skill over functionality and which promotes a safety first approach over braver and innovation. This may lead to short term success but the long term development of those players are suffering. This is the problem with a culture of fear over one of love. Love is a word which is not used or promoted, either as it does not resemble the ‘toughness’ of the sport or it is misunderstood for other definitions of what love is. Love in the sense of coaching is the environment which a coach produces to allow a player to flourish and develop without fear of consequences if the player makes a mistake. It is the bond between player and coach where the players feels he has the complete backing and trust of his coach. It is essential for development. By creating a culture where players know they can express and try things without the worry of being shouted at, they will thrive and develop. It may affect short term gains, it may mean the conceding of goals, yet if the environment is positive and the coaching seeks to develop and nurture the talent of the individuals, then the long term learning will not only improve the players skill levels, but also their confidence and their mindset. A culture of love will generate a growth mindset, whereas one of fear will develop a fixed one. This influence will transcend the lines of the football pitch and will have a major impact on how this young player approaches challenges in school, work and life in general. Therefore the environment a coach creates for their players, the positivity, the challenges, the freedom to express and create, to try and to fail, are much more important than a coaching course which simply educates key factors. Unfortunately we have too many coaches who have level 1 award and regard themselves as a coach yet base their methods on what their upbringing as a child was. Society has moved on, both in schools and sport and the way young people are in todays world is much different than the past. Unconditioned respect has gone for the majority of young people in todays world. This can be argued to be a bad thing and there are those who worry about future generations. Many believe discipline has gone. Yet the problem is that educators; teachers and coaches, need to evolve and adapt to a changing world. Respect has not gone, it haschanged. Young people now are cuter in how they act in teacher-pupil relations, they believe they have more ‘power’ yet in truth what they seek is respect from those above them. It may sound wrong and seem may not agree but todays youth expect to be respected. Yes those in the past may have expected this unconditioned respect yet was this not built on a culture of fear? Were young pupils adhering to the rules because they were scared of the consequences? Modern society has less of these consequences and so the fear has left, and in its place young people want to feel important. They do not want to be looked down or treated with dis-respect. So what does this have to with coaching? Well for me its simple. If coaches respect their players, if they include them in the learning process, if they focus on the individual, help their development and show a genuine care for their progression, if they love them, then they will have a player who will give their all to that coach, who will love them back because they respect them. It makes me smile when teachers and coaches (and even parents) bawl at these youngsters and wonder why they put up a shield. They wonder why they no longer listen. Young people want to be talked to, not shouted at. They want to be respected. Yet above all they want to be loved. The modern world is scarier than the past. There is more uncertainty in the future, more fear of what the future will hold. And the kids of today are more complex, more emotional than youngsters in the past. Many hide this with bravado and arrogance, yet underneath the majority of these youngsters there is a need to be loved and a wish to improve. As a coach you have such a great influence over your players, what you do, what you say and the environment you create can help or hinder the person (not the player). The role of the coach is more than X’s and O’s, more than results, it is the personal relationships with each individual. By gaining a greater understanding of the person, by improving the bonds and forging deeper relations, you can have a great influence over that person’s future. Love is not just a silly word, it is a necessary aspect of coaching and teaching. Liverpool to announce start of Anfield redevelopment – Telegraph.